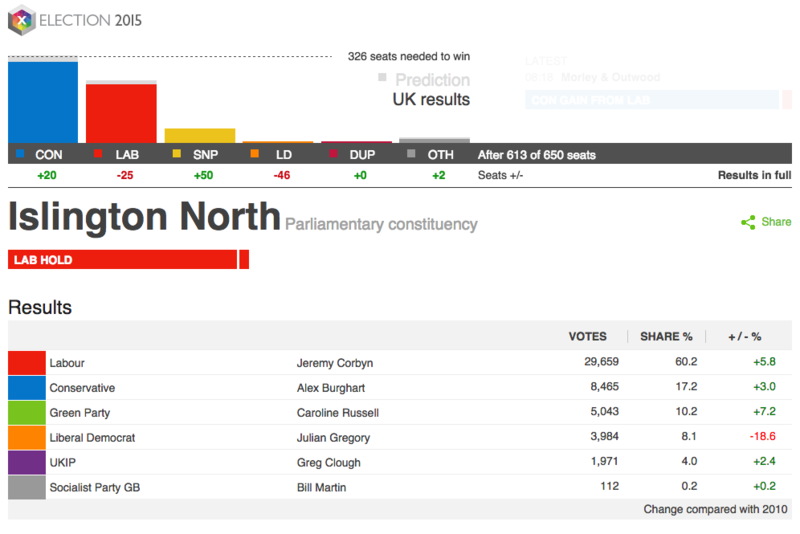 Jermey Corbyn (a good local MP) was reelected in Islington North by an increased majority, so my vote, had I been able to cast one, would not have changed the result. I’m not sure if I feel good about that or not. Looking forward to a) PR AV or some variant and b) electronic voting. Nor mine – Jeffrey Hunt increased to 60%, my vote the Raving Loonies was wasted, just bloody wasted!! 65% turn out so little improvement on 2010, all exit polls wrong, lib dems destroyed possibly terminally, SNP 50+ seats with 1.5m votes having campaigned to leave the bloody Union, UKIP 18% of popular vote, three party leaders probably resigning and five more bloody years of C3PO made of ham. Blimey. C3PO made of ham! That has definitely improved my morning – thanks. Nor mine… though not for want of trying. I applied to register as an overseas voter well within the deadline and yet when the papers arrived it said i would be registered from June onwards! Not much use! I cannot tell you how much I wanted to vote for the candidate in my constituency called.. Artificial Beast. Of the Cannabis Is Safer Than Alcohol party, in case you were wondering. The great regret I have is that I could have voted for him safe in the knowledge it would have made zero difference tothe result either way.